I first came across Isaac Tearle of Liverpool when I was researching Isaac Enoch 1863 and Enoch 1841 Stbg and Elizabeth nee Jones, because they married in Liverpool and for a while I wondered how to separate the three of them. I sent off for the marriage certificates of both Isaacs and Enochs and I discovered that Isaac of Liverpool had married in a Jewish ceremony, so he was possibly Jewish himself, and he had a witness, Lewis, probably his brother. A search for Isaac’s father, Simon of Liverpool, in the 1901 census gave me six, of whom four were Russian subjects, and I then discovered that there was a Jewish settlement of Russian emigres in the Mt Pleasant area of Liverpool at this time. However, none of these Simons was old enough to be Lewis’ father, so I have to assume that he did not emigrate. There was, however, a Simon Teffet, aged 35, Polish, Russian subject, living in Mt Pleasant, with one of his sons named Isaac, and I wondered if this could be Isaac’s brother and the origin of the Tearle name for the family. However, this is just idle speculation, in the same way as Lewis Tcharlka gave me hope. So I went looking for Maria Morris and found her in the 1881 Liverpool census, born Sheffield aged 5 (1876). Her mother, an Art Dealer aged 43 (1838), and her elder brother Arthur, 13 (1868) were both born in Poland. I couldn’t find Jane and Arthur in the 1871 census, so it seems that the family left Poland between 1871 and 1875 and went to Sheffield, where Maria was born. Abraham died before 1881, but I can’t find the certificate. When I was researching Louis/Lewis ofEdlesborough, I found another Liverpool Tearle, Lewis. Could he be the Lewis Tearle in Isaac’s marriage? When I sent off for a stack of Lewis Tearle marriage certificates, I found that Lewis of Liverpool had married Emily Isaacs in Middlesbrough in a Jewish ceremony. He gave his father’s name as Simon, a grocer. He was indeed the witness Lewis at Isaac’s marriage, because he was also his brother. When the documents arrived, I learnt some more. Here above, then is the first page of Isaac’s request to be British. His parents are the same as Lewis’ so this document confirms that they are brothers. Lewis’ request is exactly the same as Isaac’s, so I need show only one. I also now knew that Simon’s wife was Annie. This also raised the interesting idea that Maria and Isaac might have been engaged in an arranged marriage. If Isaac arrived in 1898, as his papers say, and he married in 1898, then this was a whirlwind romance. It’s possible that Lewis also had an arranged marriage. He arrived in Liverpool in 1899, a year after Isaac, and lived at 234 Conway St. The trip to Middlesbrough would be by train, or by coach or car over dreadful roads. I cannot see how they would have met by chance. The next question was; where did Isaac and Lewis come from? “Naturally, identifying Russian place-names from English-language sources is complicated by the fact that they have been transcribed from the Cyrillic. Also, within a Jewish context there may be other variations due to Yiddish forms. However, I may have found the birthplace of the two brothers. Lewis’s birthplace is evidently given as “Savil, Covno”, while on Isaac’s form it is “Savel”. The “Covna” must be the province of “Kovna” (as written in Polish) “Kovno” (Russian) or “Kaunas” (the present-day Lithuanian). I had a look for Siauliai in Wikipedia and found out it was a small city in Lithuania, but big enough to be the fourth city of that country. Google maps had a very fuzzy picture of the area, so they weren’t much help. However Siauliai once had a significant Jewish community and disastrous diseases of the late 19th century had decimated the population. I wondered if these catastrophes had inspired the brothers to leave. 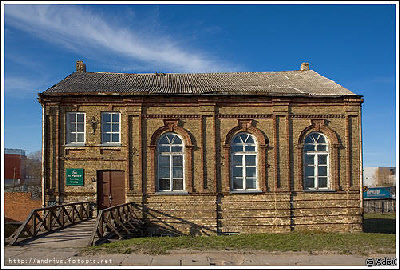 I found a short history of the Jews of Siauliai and I also found a very nice picture gallery of the Siauliai area, and I asked the owner of the gallery to send me these pictures of the synagogue. Please note these pictures are owned by and copyrighted to Andrius Maeiunas. Lithuania is now an EU state. The official Siauliai Tourism siteassures us that English is often spoken, especially in business, and that while the country is mostly Catholic, there is still a Judaic culture in Siauliai, although “only a handful.” Lithuanian is the official language and is an Indo-European language similar only to Latvian. Summer temperatures are up to 30C and in winter as low as -27C. They are in the same time zone as Bordeaux at +1 GMT. Siauliai itself is first mentioned in a battle in 1236. There is a Regional Jewish cultural association, but I am concerned about the synagogue shown here because it is very run-down and I wonder if anyone still uses it. The Jewish site mentioned above has a picture of Rabbi Yosef Zecharia Stern ( 1831-1904) whom the boys must surely have known . The same site has a picture of the Jewish cemetery and the choir of the Great Synagogue, but I wonder if they are referring to this building. A scholarly work Lithuanian Social Democracy in Perspective 1893-1914 by Leonas Sabaliunas gave me a hint as to why these men went to Liverpool. When you earned 29 roubles a month at the turn of the 20th Century and it cost 30 roubles a month for a family of four, then working-class and artisan families lived at the subsistence level. “The inability of the urban sector to absorb the influx of rural folk forced large numbers of people, perhaps as many as one fourth of Lithuania’s total, to migrate … to other countries to find work.” Our Lithuanian cousins were no different from us – we all had to move to find work. So now I had built up a picture of two Russian brothers from a Jewish family who had fled their country of origin in order to make a new life in Britain; in Liverpool, to be precise. I know that Lithuanians are not Russians by culture nor breeding, but since they had given their citizenship as Subjects of the Czar, of Russia, I thought I should call them Russians. It appears, though, being Lithuanian Jews, that they were known as the Litvaks. I now have a few fascinating snapshots of the brothers as they work throughout their lives, mostly in Birkenhead, Liverpool. Keep your eye out for the Conway St address in Birkenhead. Isaac said that he had lived from January 1898 to January 1903 at 61 Smithdown Rd, Liverpool, and from January 1903 until June 1903 at 47 Cranbourne Rd, Liverpool. He had a daughter, Sarah, aged 4 and a son, Arnold, 16m. Here is Isaac and family in the 1901 Liverpool census, with little Sarah, who is mentioned on the naturalisation papers. You can see that he and Maria are Furniture Dealers and they are living and working at 59 and 61 (house next to business?) Smithdown Rd, Edge Hill, Liverpool. We see an Arthur b1905 and a Ray b1906, but I don’t know to whom. Lelia b1912 is Lewis’ dau because her mother’s maiden name was Isaacs. However, we can follow their businesses. and finally Isaac and Lewis, just arrived from Russia/Poland/Lithuania are living in Birkenhead in 1901. So as a starting place we are looking for a Lithuanian family in Siauliai called Tarle. It is possible, then, that when Isaac arrived in Liverpool, given the publicity surrounding Osmond and Edmund Tearle, their activities and their plays, and the rising star of Godfrey 1884, George Osmond Jnr’s son, that Isaac’s surname was re-spelled as Tearle. There is no actual family link between this family and ours, but there is a link nonetheless. Mar 1903 135 Conway St Birkenhead. At this time he was married and had no children, and he was living at Maria Morris’ house, which became a business. There is a brief view between 1951 and 1953 of an A (Arnold or Arthur?) Tearle in Hoylake, Arnold Tearle, Clothier, an I (Isaac?) Tearle, Clothier an L (Lewis?) Tearle living in a private address and then Tearle’s Furnishing Stores in 135 Conway St.
Tearle’s Furnishing Stores in 135 Conway St.
I’ve found a Lelia Tearle registered in 1912 in Birkenhead, mother’s maiden name is Isaacs. She died in 1954 aged 41, registered in Manchester. Administration of her estate was given to Lewis Tearle, retired house furnisher [her father] and Arthur Tearle, house furnisher and details on the grant give her address as 15 Byranston Road, Prenton, Birkenhead and that she died at the Jewish Hospital in Manchester. Isaac Tearle also died in 1954, aged 79, registered in Liverpool south. His will gives his address as 30 Edge Lane, Liverpool 7 and probate was granted to Helena Mental, wife of Harry Mental. There’s a Helena Tearle born and registered in West Derby in 1907. She married Harry Mentel in 1936 in Liverpool North. Presumably Isaac’s daughter. In 1969 the BT phone book had this listing. I suspect that Arthur, and perhaps other members of the family, still owned the two businesses listed in Conway St, Birkenhead. In 1972, the business Tearle’s Furnishings & Radio Stores Ltd was still there, at this address in Conway St. I found little Sarah’s birth certificate in Q3 1899 in West Derby, Lancashire, which included Smithdown Rd in Liverpool, but I have no information on Arnold, Arthur or Ray. In 1923 Sarah married Joseph Heller in Liverpool, but I have not been able to find the death certificates of Isaac or Lewis. I await further information. It’s been a pleasure researching and then telling this story and if there are any family of Lewis and Isaac left in Liverpool, then I wish them health and happiness.